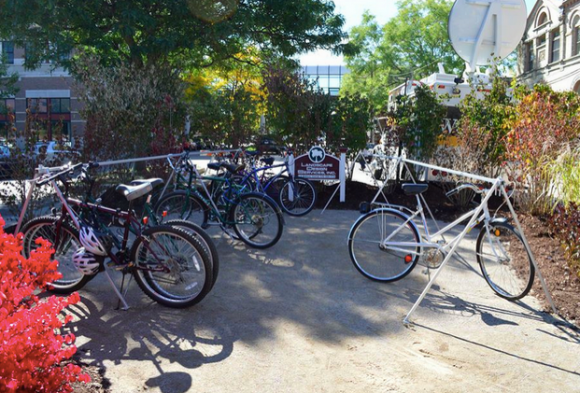 Why should you ride a bike to ArtPrize? Not only is it a fun way to get some exercise, but it’s also a quick and easy way to get around downtown Grand Rapids without having to worry about parking your car. So grab your bike (and helmet!) and gear up for some ArtPrizing. Luckily, Grand Rapids offers a growing network of on-street biking, including painted bike lanes, designated bike routes, and low-traffic streets suitable for biking. The Greater Grand Rapids Bicycle Coalition has a free, downloadable map which outlines all the bike lanes, trails, and routes to help you find your way to the ArtPrize action. Looking to shorten the commute to downtown? Every bus in The Rapid's fleet has a double-loading bike rack, making it easier to get downtown without a car. Purchase an ArtPrize Metro Pass for just $5 at area Meijer Stores starting in mid-September, and you’ll get unlimited rides on the Silver Line and 10 rides on The Rapid’s fixed routes. While you’re out biking from venue to venue, don’t miss out on the abundance of outdoor art! Explore the ‘Find Art’ section of our website to filter entries that are outdoors. So you made it downtown, but where do you park your bike? Grand Rapids has hundreds of bike parking locations — check out this interactive map from Downtown Grand Rapids, Inc. to see where you can park and wander the city. Don’t forget to bring a lock! Whether it’s reflectors or bike lights, make sure you have the right tools to help you see where you’re going and to help vehicles see you. Check your brakes, chain, lights, wheels and seat height to ensure you can ride safely and comfortably. If your bike breaks, head to one of the public bike repair stations around the city. Locations: Grand Rapids Art Museum (101 Monroe Center St.), Founders Brewing Co. (235 Grandville Ave.), and the Grand Rapids Downtown Market (435 Ionia Ave.). Wear a helmet. All the cool kids are doing it. Travel as if you were driving a car on city roads, and bike in the direction of traffic. Experience GR’s Guide to Road Biking. League of American Bicyclists’ Rules of the Road and Smart Cycling Tips. The Spoke Folks Bicycle Co-op can help you with bigger repairs and spares. While you’re riding, be sure to check out the ArtPrize Mobile App — available for free for iOS and Android devices — to find venues, events, and the full list of 1,200+ artists entries, and create your own lists to share with your friends. Once you’re downtown, head to the Visitor Pavilion at Rosa Parks Circle to begin your adventure.